What is the Game Gear? 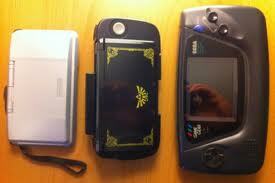 The Game Gear was SEGA's handheld console to rival the Gameboy. The major differences between the GB and GG were that the Game Gear was in color, Gameboy was in black and white, and the size difference. The Gameboy was a brick, but the Game Gear was a cynderblock. It was an uncomfortable console that was awkward to hold, and very likely to be dropped if you weren't paying attention. The Game Gear was also a battery hog, killing more double AA's than any Gameboy ever dreamed of. It used 6 at one time, and was usually played next to a wall with a AC adaptor instead of batteries. Overall, it was a decent console, but the 3DS offerings are the best, legal way to play them without problems. Screen Settings: Inside this mode, SEGA lets you chose from 3 screen configurations, a default mode, a dot by dot, and a full screen. The default is just like any other virtual console game you have played, the dot by dot is a 1:1 resolution mode, with a Game Gear backdrop. Unlike the GameBoy and GameBoy Color Virtual Console versions of this, SEGA allows to you to choose the color your back drop, red, blue, yellow, or black. Last and probably used the least is the Full Screen mode. It stretches out across the entire screen making some games look worse. Of course this is optional, and it is a great option included, but the Game Gear's graffics weren't designed for a 3DS screen. The other options which will likely never be messed with are Blur and Screen Performance, with two options, (Blur)on and off, and (Screen Performance) original and special I couldn't find much of a difference between the two with Screen Performance but with Blur, the screen moves all over, and is blurred if the option is off. I suppose these were included for traditionalists, but there is no real reason to switch from special and off. Button Settings: A full mapping system of the buttons on the 3DS, not unlike the one used in the 3D Classics. The Home Screen Menu: Shows the entire console, giving you a good idea of how big it actually was. The one feature that will drive any Pokémon fan crazy: Local Play. Thats right, in two player games like Columns and Dr. Robotnik's Mean Bean Machine, you have a multiplayer mode. After all of these years, SEGA still does what Nintendon't. One of the last Sonic games released on the Game Gear, it is arguably the best Sonic Game Gear game, but the Sonic games were low in quality on the GG, and it hasn't aged very well either. It does push the GG visually, and the game is completely original, but the physics are a little too floaty for a Sonic game in my opinion. If you want to get a GG Sonic game, definitely consider this one, as all GG Sonic games are $5 Dollars. The first Shinobi game on the GG, it changes the traditional gameplay by adding 4 additional ninja's to play as. You start out as Joe Mushashi, the Red ninja on a mission to rescue the Blue, Green, Yellow, and Pink ninja's and take down Zeed, the Criminal organization responsible for the kidnapping of your fellow ninjas. Think of this as a Mega Man game, you choose an area to play, if you beat the stage, you rescue that ninja, and get to switch character anytime you want. Each has different weapons, ranging from Katana's to bombs, and different powers, such as the Blue ninja being able to walk on water, making the water level considerably easier. A hard challenge that is well worth the $4 dollars, and highly recommended to Mega Man fans. The Game Gear title I liked the least, it is a RPG game where you are in a maze, and have to get out. You have to walk around the walls of the course to reveal the path, find items and fight random enemies. As soon as you run into an enemy you automatically begin to attack, with the only thing you can do to use imput is change up your weapon. It is a computer controlled attack system, with no imput by yourself what so ever. I find this game very hard to recommend, even for $3 dollars. Highly advise doing your research before you take the plunge. Continued in Part 2, because I hit the character limit. Continuing and finishing the series today. 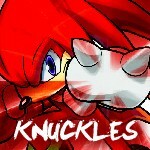 That's a nice guide knux! Thanks, you know I typed the entire thing from my 3DS.